One energy company executive, who asked not to be named, said the industry was beside itself. “One of the most concerning developments in politics is that the quality of an argument no longer matters,” he said. He went on to say that they all knew we needed to head for zero emissions. They just wanted to know what the rules would be on the way. Opposition energy spokesman Mark Butler pointed to the Energy Security Board modelling which showed an annual saving of around $150 a year for the NEG which would be due largely to investor certainty. That is quite apart from the cost of energy production and I think can be attributed to sentiment and cheaper money because of reduced risk. The modelling also showed that having no policy would add another $300 to bills over a decade. “I can’t see how the death of the NEG will have helped suppress future prices. Future contracts represent the market’s consensus view of where electricity prices are headed,” Energy industry expert Paul McArdle, who is the chief executive of energy software company Global-Roam, said. Future prices in most states started heading north from mid-August in most of the 36 contracts as investors saw the Coalition’s signature NEG slowly being dismantled, according to Global-Roam. Future prices for 2019 have jumped to $86.77 per megawatt hour in NSW, $92.93/MWh in Victoria, $72.42/MWh in Queensland and $96.71/MWh in South Australia, according to ASX Energy. The PM reckons we’ll meet the targets “in a canter”. “We’re on track to achieve them,” the new Environment Minister, ex-mining industry lawyer and mining executive Melissa Price, also reassured radio listeners, adding that she supports the construction of new coal-fired power stations. Foreign Minister Marise Payne — back from meeting Pacific Islands leaders whose nations literally face an existential threat from climate change — joined the chorus, as did Energy Minister Angus Taylor. Australia is on track to “meet and exceed” the Paris commitments, according to Trade Minister Simon Birmingham. “We are already more than meeting the 26 per cent that was set down in the Paris agreement,” National Party leader Michael McCormack confidently told David Spears on Sky News, though when pressed, he was a bit unsure about what information that claim was based on. “Well it’s er, based on, er, the figures that er, the data that is, er, produced by those people who measure emissions, as far as I’m aware,” he said. these reassurances are at completely at odds with the Government’s own official advice. 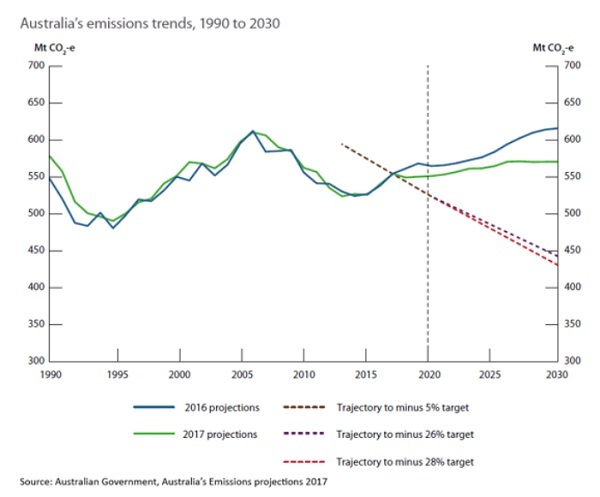 Australia’s commitment to the global community is to cut greenhouse gas emissions by 26 to 28 per cent below 2005 levels by 2030. Just before Christmas last year, the Australian Government published a report which suggests that — without significant policy change — Australia will miss that commitment by a long way. Emissions in 2020 will be just 5 per cent below 2005 levels, according to the official projections and — without further measures to cut them — emissions will grow by 3.5 per cent on 2020 levels in the 10 years to 2030. In other words, we’ll go backwards in the coming decade. In truth climate minister Melissa Price has been tasked with coming up with the necessary plans, but it looks like mission impossible with the energy sector policies in shambles. The Australian Competition and Consumer Commission’s 56 recommendations on the electricity market were predicted to bring electricity prices down by an average of $409 by 2020-21, but the Coalition cherry-picked a handful of market interventions, including setting a default contract price and the federal government helping underwrite new generation, rather than all, the recommendations. We have full-scale sovereign risk. Labor was talking to stakeholders “about a policy that will pull through the investment we need to renew a system that is getting old and increasingly unreliable, will cut pollution, drive jobs, and particularly put downward pressure on power prices once and for all”. He all but ruled out carbon price schemes such as an emissions intensity scheme because they “require a level of bipartisanship”. Old coal is neither dispatchable nor reliable. This week’s Essential Report (whole report here) shows that voters want action on reducing carbon emissions to the tune of 69-23. Even Lib/Nat voters favour action 62/32. New modelling forecasts Labor’s 45% target will force down Australian prices but government’s 26% will not. 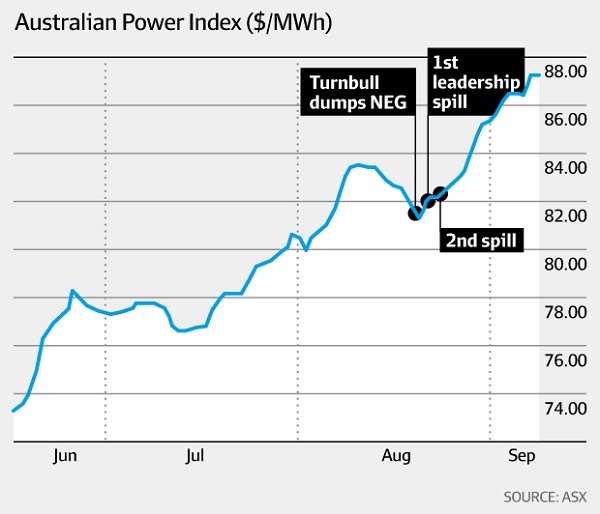 Over the life of the Turnbull government’s scheme, wholesale electricity prices are forecast to fall initially, reflecting the entry of already committed renewable capacity, then rise above $70 per MWh after the Liddell coal plant in New South Wales closes, then climb to $80 per MWh after the expected retirement of Yallourn in Victoria 2028. But RepuTex says if the emissions reduction target was higher, at 45%, the policy would impose a constraint on emissions from coal-fired generators, and drive more new investment in large-scale renewables, adding more than 22GW of solar and wind capacity. “Similar to the price decline under the 26% scenario prior to 2020, the competitive pressure from higher solar and wind energy is modelled to push wholesale prices lower, eventually resulting in the closure of excess coal capacity,” the analysis says. The modelling assumes the AGL-owned Liddell plant closes in 2022, with other coal plants retiring closer to 2030. It then assumes renewables will displace some dispatch of gas generation during the day, which increases the opportunity for energy storage of excess renewable energy. “As a result wholesale electricity prices oscillate around $60 per MWh through to 2030, rather than rise above $80 per MWh as seen under the low investment scenario under a 26% Neg,” the analysis says. Stephen Long is right, there is a Trump-like character to this government. Former politician and Queensland businessman Clive Palmer’s plans to build a $1.5 billion ultra supercritical coal-fired power station in the Galilee Basin, about 500 kilometres from the coast, have been met with a mixture of disbelief and cynicism about whether the unlikely project will see the light of day. Virtually all new generation being constructed in Australia is solar photovoltaics (PV) and wind energy. New-build coal power is estimated to cost A$70-90 per megawatt-hour, increasing to more than A$140 per MWh with carbon capture and storage. Solar PV and wind are now cheaper than new-build coal power plants, even without carbon capture and storage. Unsubsidised contracts for wind projects in Australia have recently been signed for less than A$55 per MWh, and PV electricity is being produced from very large-scale plants at A$30-50 per MWh around the world. And the South Australian concentrated solar thermal (CST) 150MW with 8 hours storage Aurora project is capped at $78/MWh. But that’s a one-off generator unit – larger (say 200 – 220 MW capacity per generator units) with more energy storage (say 16 to 17 hours energy storage each at max power output) to increase capacity factor (to say 65 to 70%) and multiple concurrent-built (say five) generator units, delivering electricity over a 20-year supply contract period, would likely be significantly cheaper. The question is: Could this strategy push CST (dispatchable solar) energy supply costs below $70/MWh or lower (even low $60s/MWh)? The interesting thing to see is whether Queensland electorate constituents will be duped by Clive’s promises for a coal-fired power station. I suspect wily Clive has his eye on the Commonwealth Northern Australia Investment Facility (NAIF) to fund it at tax-payers’ expense. Will the Queensland Government veto NAIF funding? We’ll see. 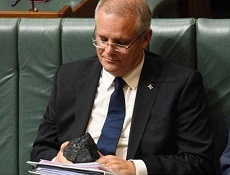 Voter concern about climate change has surged and about half of Australians want new coal mines banned, according to new research that suggests the Morrison government’s relegation of emissions reduction is at odds with public sentiment. The article refers to new research by The Australia Institute published today. Yes, TAI have taken over Climate of the Nation from the Climate Institute, which went defunct last year. I’ve promised myself to do three posts I’ve been wanting to do for some time, then I might get back to looking at it. Giles Parkinson, Editor of RenewEconomy, from time interval 34:45 through to 53:10. We [i.e. Australia] benefit by exporting a vast amount of fossil fuels, and if you include our exports, then we are the sixth largest carbon polluter in the world, after basically China, the US, Russia, and just behind Saudi Arabia [cough] – pardon me – umm… just behind Saudi Arabia basically, and, and the problem… And India, sorry. And the, the problem is that if we… What we do matters. I mean, Australia’s ah… total emissions, including exports are very substantial indeed, and it is, it’s basically completely irresponsible, and a crime, basically a crime against humanity, in my view, for us to sit here and say, well we can keep expanding our exports. I mean, even today, what we’ve locked-in in terms of expansion of LNG exports, for example, is going to mean that within a year or two, we’re going to become the fourth largest carbon polluter in the world. Now, if we do nothing, then why should anybody else do anything? On page 11: Global coal consumption in 2017 fell to 27.6% primary energy share, and natural gas accounted for 23.4% of global primary energy consumption. Renewable energy hit a new high of 3.6%. Giles Parkinson laments the lack of knowledge most journalists display when reporting on energy technologies, and suggests most of them allow mistruths/lies to remain unchallenged. I recommend you listen to interviews with Ian Dunlop and Giles Parkinson in full. Senior Labor sources have confirmed the opposition is seriously considering resurrecting the National Energy Guarantee, subject to discussion with stakeholders, believing it could achieve the bipartisan support needed to broker an enduring ceasefire in Australia’s climate wars. I can’t see why Labor is spending effort on resurrecting the NEG. It certainly needs to be extensively reworked to encourage more renewables into the NEM. The key point that I would like to get across is that the game is up—wind and solar photovoltaics [PV] have won the race. It is a lay-down misere. The number one new generation technology being installed around the world is solar PV, number two is wind, and coal is a distant third. This year, roughly 200 gigawatts of PV and wind new generation capacity will go in around the world, while only 50 gigawatts of coal will go in. That is a difference factor of four between PV and wind and coal. In Australia, virtually all new generation capacity is PV and wind. The reason for this is that PV and wind are decisively cheaper than coal, even when one adds the additional costs to stabilise a variable renewable energy supply, such as storage, primarily in the forms of batteries and pumped hydro; stronger interconnection; and some spillage of wind and PV. That is the basic message I have. If you want cheap electricity you push renewables as hard as you can. Climate and energy policies are inextricably linked. Yesterday, posted at crudeoilpeak.info is an article headlined What happened to crude oil production after the first peak in 2005? by Matt. Fig 13: Cumulative crude production changes since 2005 shows only Iraq and the US provide for global growth in oil production. Assuming that the balancing act between declining and growing countries continues (from Mexico through to Canada) the whole system will peak when the US shale oil peaks (in the Permian) as a result of geology or other factors and/or lack of finance in the next credit crunch and when Iraq peaks due to social unrest or other military confrontation in the oil producing Basra region. There are added risks from continuing disruptions in Nigeria and Libya, steeper declines in Venezuela and the impact of sanctions on Iran. The sooner Australia transitions away from petroleum oil dependency the better. Energy economist Anas Alhajii told Fairfax Media the world is headed for a potential oil shortage with prices to rise above $US100 a barrel. “Oil demand has been underestimated and it will be way higher than forecast by the International Energy Agency,” Mr Alhajii said. “We can expect to see demand rising and oil hit much more than $US100 per barrel again. Australia has a serious problem as it is rich in every energy source except for oil, so it has to import it. “We’re heading for a major energy crunch,” he said. The energy company made clear at its annual general meeting that it remains committed to the flagged closure of its 1680 megawatt Liddell coal-fired power plant in 2022. Giles Parkinson at RenewEconomy also has his post on the same subject headlined AGL promises no change in strategic direction, coal closures not “ideological”. Taylor has made much of his desire to stop coal plant closures, to underwrite the construction of new “fair dinkum” baseload, or to support the upgrade of existing plants. AGL seems to be suggesting the most effective thing he can do to keep coal plants on line and profitable is to introduce capacity market. “The question of how to provide the back-up capacity in the system for when wind and solar generation is not available – known in the industry as “firming capacity” – is, in my opinion, such a key component of making energy more affordable for all,” Redman said. “Simply put, an electricity market that only pays generators for the energy they sell requires periods of extreme high prices to provide a return on new investment. “That’s because firming plant costs a lot to build but isn’t required to generate electricity much of the time. Yet this price volatility – to the extent that it affects prices for customers – is an understandable cause for concern. Capacity markets are, however, controversial. In Western Australia, they are used but are seen as farcical because of the added costs imposed on consumers for plants that are built but never used. While I have been a long time advocate of moving to to contracts with a large available capacity component (rather than simply paying for power supplied, for coal fired power in particular we need to to recognize that there are different levels of “availability” depending on how long it would take to get the generator up to full capacity. We also need to recognize that, in the case of generation systems that require fuels, there will often be problems setting up fuel supply contracts for unpredictable demand or demand that only occurs over a small part of the year. Keep in mind here that coal stockpiles will deteriorate over time and may catch fire. For new capacity, the capacity contract should be long enough to justify the investment. John, I’ll just mention once again the potential of demand response, which, from memory, has been used in Queensland since 2006. Not only commercial and industrial users, both Energex and Ergon have Peaksmart available to turn down home aircon. I imagine the whole demand response thing works better if you have state-owned distributors which carry out the retail function. Brian: Agree that demand management has a lot of scope for reducing peak demand or as a response for power system failures. Most manufacturers and miners cannot sell everything they could produce if they ran 24/7. In some cases they would need a warning to allow controlled shutdowns or have to limit power off times to prevent potline freezing or other problems. Even then it may be practical to run a potline on reduced power without causing problems. Think your way through your house. Most of the power consumed in a house doesn’t have to be on demand. Lots of stuff can be shut down for at least some time most of the time and things like clothes dryers could have starts delayed. Much the same could be said about other public and business consumption. The aircon must be a DRED (Demand Response Enabled Device). See here for the Department of Climate Change and Energy Efficiency – Appliance Energy Efficiency Branch Submission for the Australian Energy Market Commission in response to the Issues Paper: Power of choice – giving consumers options in the way they use electricity, dated August 2011. Brands including Daikin, Fujitsu, Mitsubishi Electric and LG, have in recent years offered DRED capability on at least some of their aircon models, usually as an add-on option. That’s a good idea, Geoff. Suppose retailers offered bonus (higher) feed-in tariffs during peak load periods on domestic (or commetcial) solar pv? Every little bit can help. Shed loads of Load Shedding!! Suppose retailers offered bonus (higher) feed-in tariffs during peak load periods on domestic (or commetcial) solar pv? Provided your meter is “smart” AND configured to read solar-PV exports at discrete (i.e. 30 minute) time intervals, AND your energy retailer offers that option. Victoria introduced mandatory “smart” meters a few years ago. NSW is a much slower to implement “smart” meters – it’s still only voluntary. My electricity network import and solar-PV export meters are “basic” and measure only accumulated energy in kWh – i.e. flat rate – so they cannot measure time of day import or export. to the new “smart meters”. Seems to have vanished now. I’m not sure solar PV is working too well during peak load periods. Do you have any graphs time of day load demand in Victoria that you see as accurate and credible ? Both summer and winter would be great. Do you have any graphs time of day load demand in Victoria that you see as accurate and credible ? If you did it would support your hypothesis. Zoot: The growth of solar has moved the daily all except solar peak demand from about midday to late afternoon early evening. A logical slot for solar towers, batteries or pumped hydro. In the Guardian online, a report that Australia’s quarterly emissions data were released without fanfare on Friday afternoon. An estimated 1.3% overall rise in the year to the March quarter. A drop in emissions from electricity generation. A claim that agriculture continues to provide reduced emissions. Bill Hare says we are not on track to meet our Paris commitments. How can that be? Minister Freydenberg and PM Turnbull and PM Morrison have been assuring the public that we will meet them in a canter. No problems. She’ll be apples, mate. Not a worry. Is someone being more economical with the truth than the nation is being with emissions output?? Not economical with the truth, Ambi, rather living in an alternative reality where what you say comes to be without doing anything at all. Problem is some day they will wake up in fright. As this graph illustrates, solar became the biggest supplier on four occasions last week – Monday, Wednesday, Thursday and Saturday – when its share reached 40 per cent. It should be pointed out that solar’s total share of the week was still at a relatively small 7 per cent, but this is expected to grow significantly as the pipeline of new projects joins the grid. Solar-PV needs energy storage to support high demand in the early morning, late afternoon and early evening. Energy and Capacity Value: Molten salt storage allows a CSP facility to shift energy generation to match the highest‐value times on the grid. With enough storage, this shift includes covering both the typical “peak” period, and also the unexpected event of a price spike at another time, whether morning, evening, or overnight. This shifting ability allows CSP to replace conventional infrastructure not only for energy supply but for reliable capacity supply, meaning it can fully replace baseload generators like coal power plants. Storage enables CSP to operate at a high capacity factor which leads to a higher utilisation of transmission infrastructure, reducing the capital and environmental cost of building new transmission lines and interconnectors. Because CSP can operate reliably and stably, it reduces the fuel use and Operations and Maintenance (O&M) impact of flexing the conventional generation fleet in response to intermittent solar and wind conditions. But solar-PV Levelised Cost of Energy (LCOE) is of the order of AU$30-50/MWh, and wind LCOE is of the order of about AU$50-55/MWh, then add costs for storage (i.e. 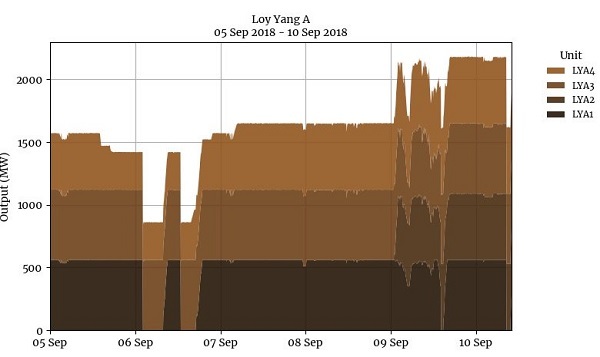 pumped-hydro and some battery storage) and interconnectors (up to AU$25/MWh, per Professor Blakers). There’s currently much more installed solar-PV and wind capacity (compared with CST). South Australia’s project Aurora CST is capped at AU$78/MWh. There’s much less installed CST capacity – it’s still regarded by some as an emerging technology – but hopefully that attitude will change with Aurora (and other large-scale CST projects in other parts of the world) becoming operational and demonstrating their capability. I think there’s scope to reduce CST LCOE significantly further, but that requires “fair dinkum” competitive tender processes. Solar-PV and wind can complement CST. The problem with that is “some day” may be too late. Ian Dunlop spoke of the influence of vested interests at the Australian Senate Foreign Affairs, Defence and Trade References Committee inquiry into the Implications of climate change for Australia’s national security at the public hearing on 8 Dec 2017. I think part of the problem is that there is a strong lobby around the world amongst fossil fuel interests to maintain the status quo of the fossil fuel industries. That is strong in Australia, it’s strong in the US and it’s strong in Canada. When you’ve been in industries, I guess, for 20, 30 or 40 years, always accustomed to economic growth increasing and the expansion of your industry, it’s very hard to accept that the world might be about to be turned on its head. I think what we’ve been seeing is a rearguard action from the fossil fuel industries over 30 years now to prevent that change happening. So you get into extreme levels of denial on these issues where it doesn’t matter what science or evidence is put forward; there will always be a group of people who will never accept the implications of climate change and the evidence around them. That, unfortunately, I think is continuing today, and it has now become extremely dangerous to the future of this country. It is not a question of what proportion of fossil fuel you have in the economy from now on; we actually have absolutely no choice. We now have to wean ourselves off fossil fuels as fast as we can. We have to do it sensibly so that we don’t cause more social disruption than necessary, and that means planning for it, not just pretending it’s not happening and leaving it to the last possible minute, when you’ll end up in major social chaos because of the lack of preparedness to make that change. I think the reason essentially is the power of the fossil fuel industries, which has got out of proportion. You can argue that historically that’s been a great benefit to Australia. It’s now become, in my view, a great weakness, and that has to change. Australia’s greenhouse gas emissions have continued to climb, reaching the highest levels on a quarterly basis since 2010, led by a surge in gas production. For the 12 months to March 31 2018, emissions totalled 529.9 million tonnes of carbon dioxide-equivalent, up 1.3 per cent from a year earlier, the Environment Department said in the report released on Friday afternoon. Fugitive emissions, mostly from the gas sector, jumped 13.7 per cent. I mean, even today, what we’ve locked-in in terms of expansion of LNG exports, for example, is going to mean that within a year or two, we’re going to become the fourth largest carbon polluter in the world. As petrol prices edge towards $1.70 a litre, a historically high watermark, households are being forced to make a choice: ditch the car and take public transport or simply drive less, but for truckies and farmers this is not an option. For comparison, the average price of petrol in 2000 across the main cities was 91 cents. KPMG economist Brendan Rynne says our standards of living are being eroded by higher power bills and rising petrol prices, and with wages increases few and far between, households and businesses are feeling the squeeze. The average car goes about 15.000km p.a which would require 750 litres of fuel for a small car consuming 5 litres/100km. At $1.74/litre the weekly cost works out at $25/week including recreational car driving. The financial case for using public transport instead of an already owned car is weak. So, if “already owned”, it’s fair to exclude the registration fee and insurance premium from the calculation? To attend a big sporting or musical event in a capital city, public transport might be preferred. No parking fees or road congestion to deal with…. The AFL and Victorian govt push public transport very hard for the football Finals, Melbourne Show, Aust Tennis Open, etc. Eventually we all come to Love Big Nanny. Fixed costs such as registration should only be included if the alternative being considered is selling the car and depending on public and active transport. Cost comparisons should only include the things that will change. And my example of travel to big events represents only a tiny fraction of annual metropolitan kms travelled. Outside SEQ in Qld Ergon is the retailer as well as the distributor. In SEQ the distributor Energex does the metre-reading for the retailers. Not sure how the money works. The average car goes about 15.000km p.a which would require 750 litres of fuel for a small car consuming 5 litres/100km. Are you sure about that, John? You may have a road vehicle (that you may own outright) that is relatively new that has a very good fuel efficiency with you driving it in a frugal/efficient manner, but I think you are assuming everyone else is doing the same thing – my point is: don’t count on it without doing the analysis using credible data – don’t assume. Per ABS statistics, the average age of Australian cars is 10.1 years, unchanged since 2015. What was the average fuel efficiency of cars 10 years ago and older? Are these older cars being maintained adequately to ensure they are continuing to achieve their near new fuel efficiency, or are they worsening with age? And what terrain are these vehicles being driven over (i.e. hilly or flat?) and how are they driven (i.e. efficiently/sedately or like a race car)? At $1.74/litre the weekly cost works out at $25/week including recreational car driving. John, is your fuel bill circa $25/week per vehicle, lower or higher? Do you align with your own assumptions and calculations? You may, but don’t assume everyone else does. Where I live I see many SUVs and light trucks (i.e dual cab utes) that are not so fuel efficient, so I doubt the weekly fuel bill would be as low as $25/week unless the vehicles are travelling very little distance, I think unlikely for this area. The financial case for using public transport instead of an already owned car is weak. I think it depends on where you live, and how adequate public transport is to provide alternative, viable options. In rural and regional areas there are very few or no public transport options, but in large cities, you may find a different story. Owning and operating a car isn’t just about fuel costs. Other consumables include tyres, oil filters, engine oil, brake pads, etc. Tyres and lubricants generally have at least some raw materials derived from petroleum – these consumables aren’t getting any cheaper either. If you are replacing or purchasing a new air-conditioner, help manage peak demand by choosing a PeakSmart air-conditioner. You’ll be rewarded up to $400 by connecting it to the PeakSmart program. 4kW to less than 10kW cooling capacity provides a reward of $200. 10kW or more cooling capacity provides a reward of $400. If you have an aircon with less than 4kW cooling capacity then you presumably get no reward for your effort. The signal receiver in ‘PeakSmart’ enabled aircon units (I suspect) uses a Ripple Current Device (RCD) receiver – the same technology that enables off-peak hot water systems to operate. RCD switching can operate with or without “smart” meters. “Smart” meter units usually have available at least one metered circuit with RCD switching built-in for off-peak water heater system network control. Availability of “smart” meters are a separate issue from the “PeakSmart” programme. I think/suspect you don’t need to have a “smart” meter to take advantage of the “PeakSmart” programme in Queensland. From 1 December 2017, all new and replacement meters in Queensland must be digital. So, it seems to me it will take a considerable amount of time for Queensland (and NSW) to transition from “basic” metering to “smart” metering. Geoff M, I think the main idea with the digital meters is that they can be read remotely, so no-one need physically read the meter box. The added advantage is that the grid peple can turn down your appliances such as aircon, which would also need to be smart. Our smart meter is certainly read remotely, Brian. – from the Victorian era. Geoff M, I think the main idea with the digital meters is that they can be read remotely, so no-one need physically read the meter box. That’s the idea, but as the replacements of “basic” meters with “smart” meters in Queensland is not mandatory unless there’s a requirement to replace existing faulty or add a new unit (because perhaps you are adding solar-PV or adding additional phase) then I don’t see the transition from “basic” to “smart” as being rapid. Victoria had a mandatory replacement of “basic” with “smart” meters. And in NSW it’s voluntary. “Smart” meters will do away with jobs – the meter readers. The added advantage is that the grid peple can turn down your appliances such as aircon, which would also need to be smart. I think/suspect you don’t need to have a “smart” meter to take advantage of the “PeakSmart” programme in Queensland.